Kyle Hufford (left), ssistant professor of communication and FiveCore Media general manager, speaks during the premiere of "Deep Dive." 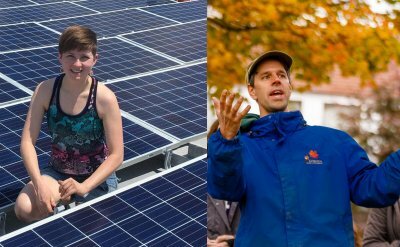 He is joined by Jody Saylor, associate professor of biology, and Ryan Sensenig, professor of biology. 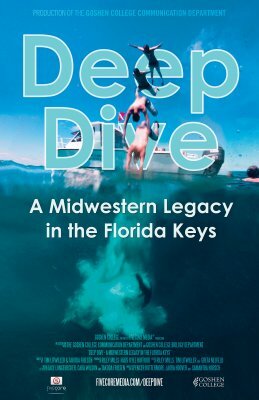 A year’s worth of work for a team of more than fifteen Goshen College students culminated in the premiere of their documentary, “Deep Dive: A Midwestern Legacy in the Florida Keys,” on Tuesday, March 27, at 7 p.m. in the Goshen College Umble Center. The film chronicles the 50-plus year history of Goshen College’s Marine Biology program and the relationships built with the Layton, Florida community where the facility is housed. 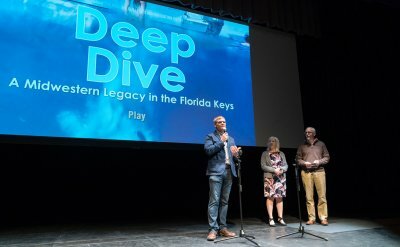 “Deep Dive” premiered in front of more than 215 students, staff and community members. The film recently won two Indiana Association of School Broadcasters (IASB) awards, as well as second place for best short film (fictional narrative or documentary) and another second place for best cinematography. The IASB are the top state awards for colleges with media and broadcasting programs. At the end of the night, Ryan Sensenig, professor of biology, talked about the future of the marine biology program, which will include a new major in the program and a new marine biology semester at the Goshen College facility in partnership with Old Dominion University. The film will also be submitted to film festivals around the country and to various professional and academic competitions. 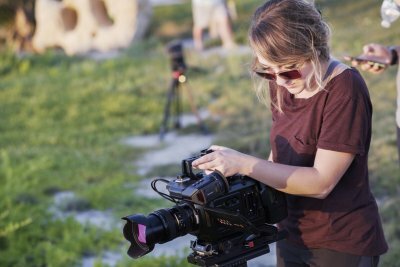 Last May, six film students joined 12 biology students for a three-week course taught at GC’s J. N. Roth Marine Biology Station in Layton, Florida on Long Key. In it’s 51st year of operation, this course combined elements of communication and biology for an immersion in not only the community of Layton, but the differing disciplines as well. Biology students were enrolled in an upper level marine biology course, taught by Jody Saylor, associate professor of biology, while communication students took part in the class titled advanced digital media immersion, taught by Kyle Hufford, assistant professor of communication and FiveCore Media general manager. The film students literally got in the water with the biology students to participate in and film some of their activities and projects. The film students worked to create a documentary focused on highlighting the legacy of the marine biology program and its relationship with the surrounding community. At times, the film crew went door-to-door in to see if community members were interested in being interviewed. 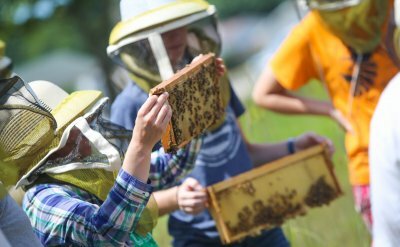 “The students had to figure out who to talk to and do a lot of research on the ground to arrange things,” Hufford said. He added that the town of Layton played a big part in the development of the story. “The community itself is really a character in the documentary, and the majority of interviews were community members,” he said. Being outside of Goshen offered film students the chance to engage with storytelling in a different way. They filled the roles of a traditional film crew, including producer and director, and worked to develop skills in working as a team to produce a large-scale product. The course also gave film students the opportunity to work with different equipment and develop a different set of skills. With the use of a drone to capture aerial footage and small, underwater cameras to capture shots of biology students working beneath the surface, film students gained a wider understanding of the tools needed for different settings. Sophomore biology student Jose Chiquito Galvan spoke to the connection between the disciplines that took place in Layton.